Running Past has already covered one of the many streams that flow into the River Pool whose sources are in the high ground of Sydenham Hill – Adams’ Rill – which rises a little way down the slope around Peak Hill. 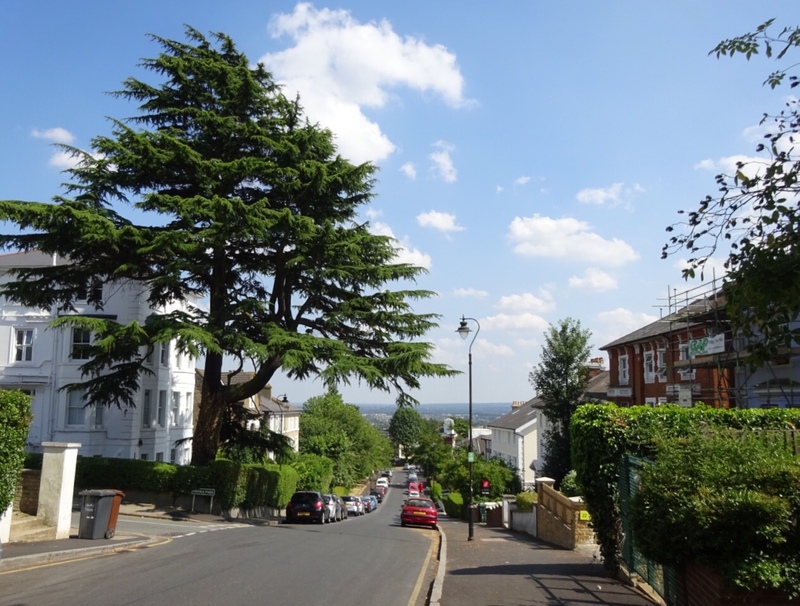 The second of the streams has two main sources, both almost as high as it is possible to get in in the catchment – close to the watershed with the Effra, known locally as Ambrook River, of Sydenham Hill – the road, rather than the area. Sadly, the watercourse seems to be nameless; however, if, dear reader, you are aware of an appellation please do get in touch. But for the purpose of this post, I will give it a name. The first part is relatively easy – the watercourse is only visible in Wells Park so it seems appropriate to use that. The second element is trickier; I am slightly tempted to continue with ‘Rill’, despite its geographical inaccuracy. There are strong regional variations in stream naming conventions – the most common in the south east being Brook and Stream. 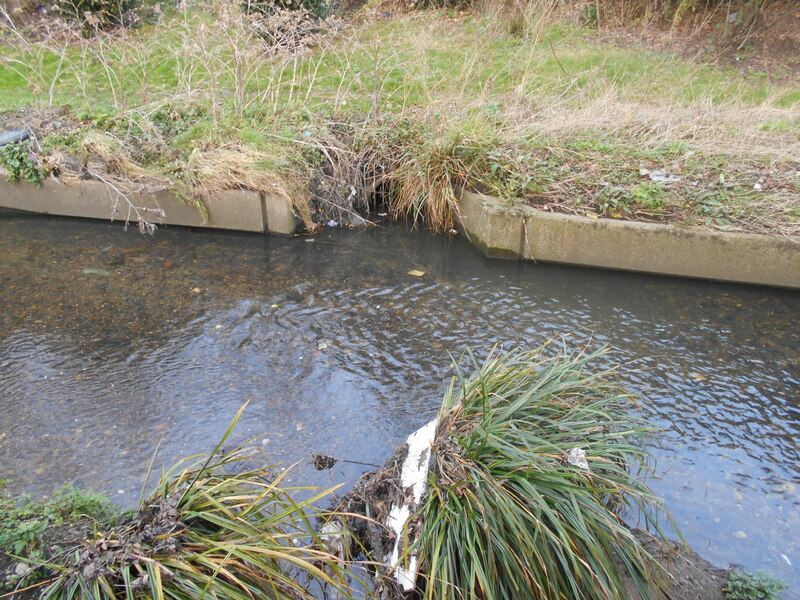 Locally, in the neighbouring Quaggy catchment ‘Ditch’ was the most common name for a small watercourse – appearing in Hither Green, Milk Street and Grove Park to name but three; it even has a counterpart in the Ravensbourne catchment – Chudleigh Ditch, also known as Honor Oak Stream. The latter though is a suffix is used by a couple of nearby watercourses in the Pool catchment in Penge – Border and Penge Streams – so it probably has to be Wells Park Stream. 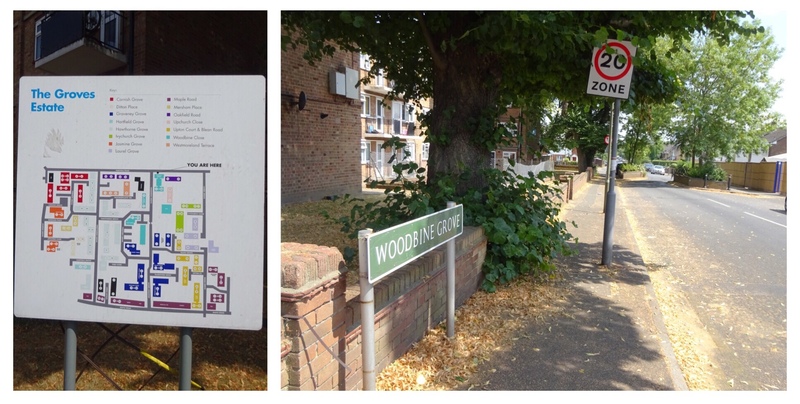 The northerly source is around the housing association development of Mount Acre Close – the westerly pond on the map below; there is some impenetrable chain link fencing at the side (above, left), protecting the careless intrepid urban explorer from a deep gully. There is no obvious sign of water though. The rest of the estate is guarded by robust looking close boarded fencing. The reason becomes obvious when looking at late 19th century Ordnance Survey maps, the steep slope behind the fencing is a deep railway cutting – part of the line into Crystal Palace High Level station from Nunhead – where it met up with the Greenwich Park Branch covered a while ago in Running Past. 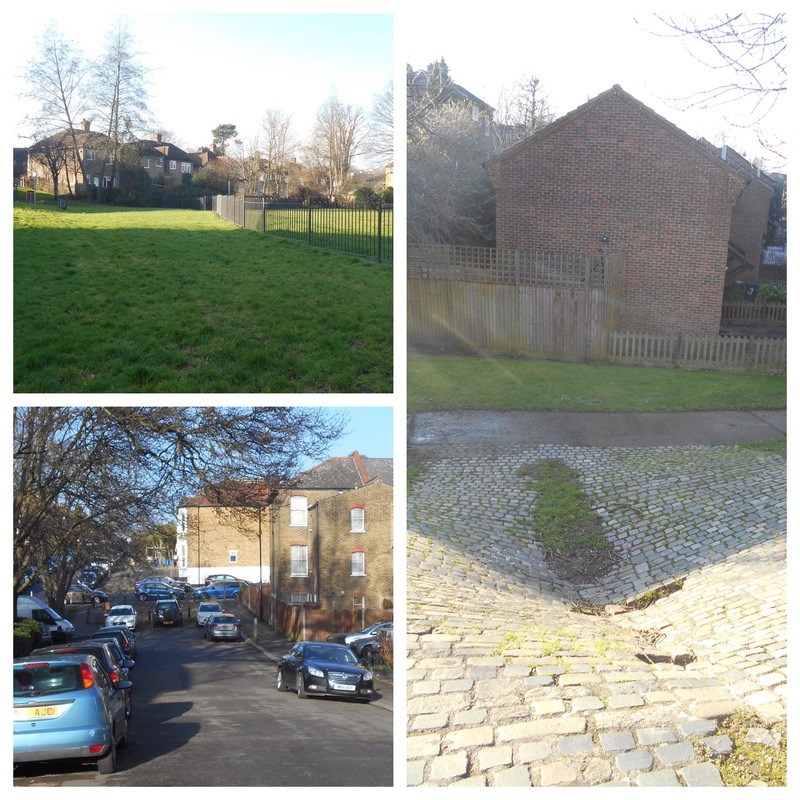 The former railway has annihilated the contours indicating the stream’s route at the foot of the cutting, now the social housing of Vigilant Close, managed by Lewisham Homes (bottom photo above). 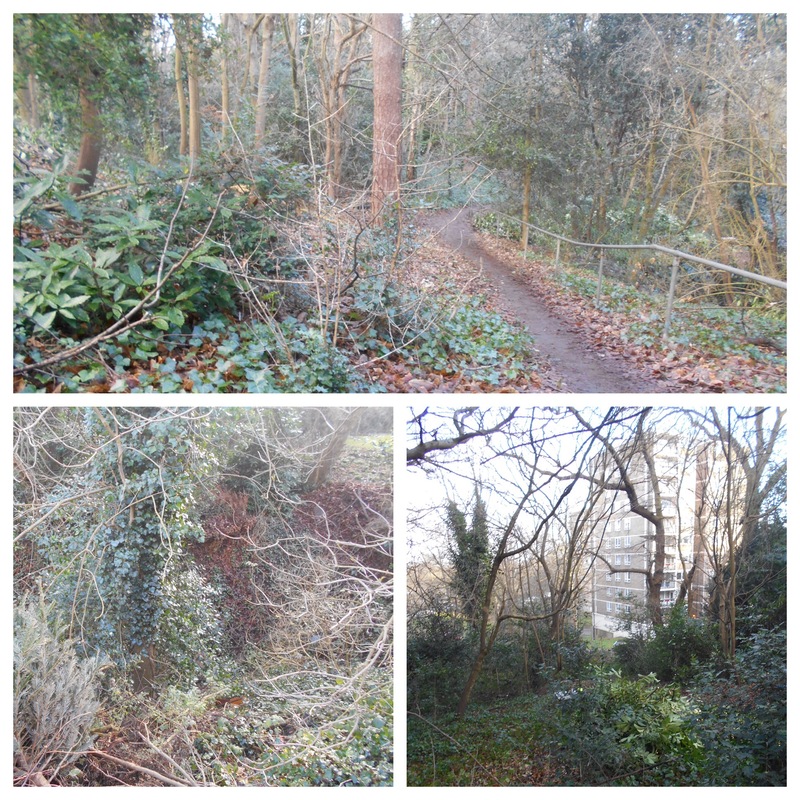 The likely route seems to roughly follow a path through gardens to Longton Avenue, although the ‘private land, no public access’ signs as I emerged suggest I may have gone a little off track… A fierce look from a window should perhaps have been a warning. There is a tell-tale dip in Longton Ave, caused, no doubt, by the stream’s erosion – all too obvious to the fluvial flâneur. 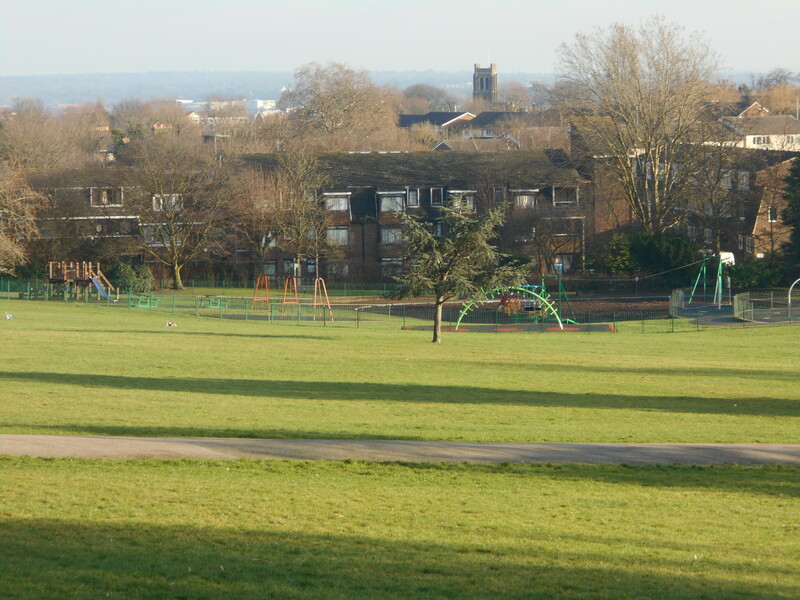 Beyond the tarmac, and into Sydenham Wells Park, a vista of the rest of the route emerges. On a clear day it is possible to pick out the gas holders adjacent to the confluence with the Pool, but it was a little harder on a slightly hazy winter’s afternoon. The distinct valley through the Park though is obvious – part of a much larger one bounded by Wells Park Road and Westwood (formerly just West) Hill. The southern source too would have been close to the watershed; it too has been truncated by the arrival of the steam train to serve the visitors to the Crystal Palace. The Green Chain Walk tacks up the side of the cutting behind the tower of Cambria House – there are one or two dips in the well managed woodland hillside (work was being carried out by Friends of Hillcrest Wood and the London Wildlife Trust when visited) which hints at possible former courses. Back on High Level Drive (a continuation of Vigilant Close) there is a clear dip which is roughly in the right place for the formerly flowing stream, although the railway disruption makes this less than certain. 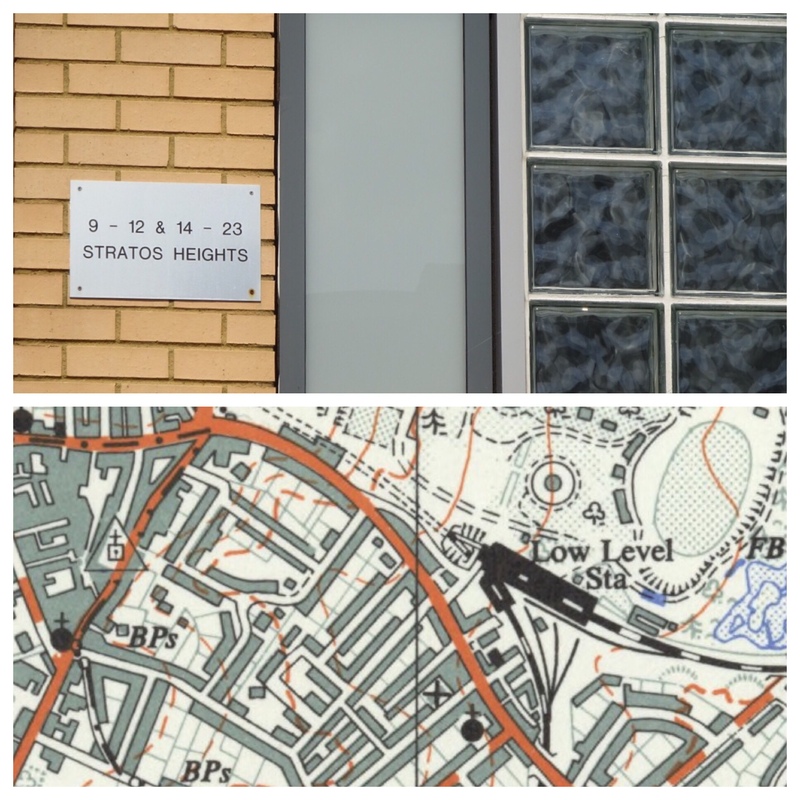 The landscape has effectively become terraced to make best use of the land with roads hugging the contours of the hill; passage to the next stratum of housing down, Longton Avenue, involves a circuitous detour. A little further to the east along Longton Avenue was one of the homes of C S Forester, covered a while ago in Running Past. “Advantage has been taken of the natural undulations and the existing watercourses … and was ornamented by a succession of small lakes and rivulets”. The stream actually flows as a stream for twenty metres or so before disappearing into a culvert which seemed to have a rudimentary trap to prevent underground blockages downstream. 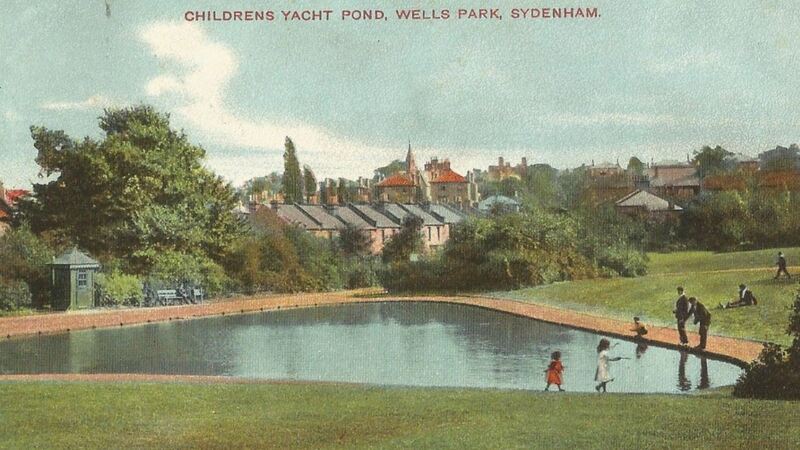 There seems to have been another pond, the Children’s Yacht Pond, lower down in the Park which has now been filled in (Source – eBay July 2016). 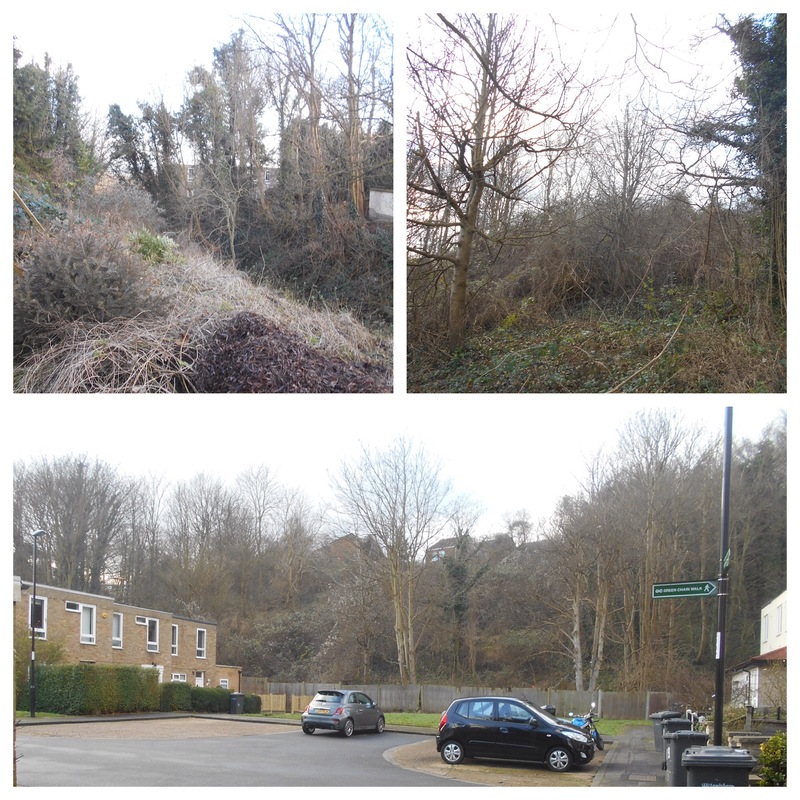 The exact location of the former confluence of the two branches of the stream is probably just beyond Taylors Lane. 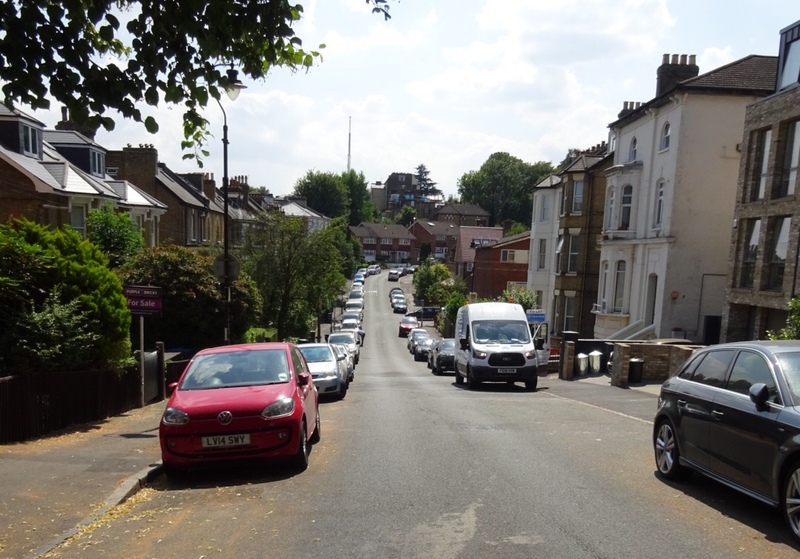 There is a clear dip in the road close which marks the boundary between Victorian terrace and 1970s council housing as well as the location of the stream (when it flowed). The path downhill is clear the stream’s route is a relatively deep valley between the higher land of Wells Park Road and Westwood Hill, it appropriately follows Peter’s Path. There was a pair of small ornamental lakes here when the Ordnance Survey cartographers called in 1863 (see above). 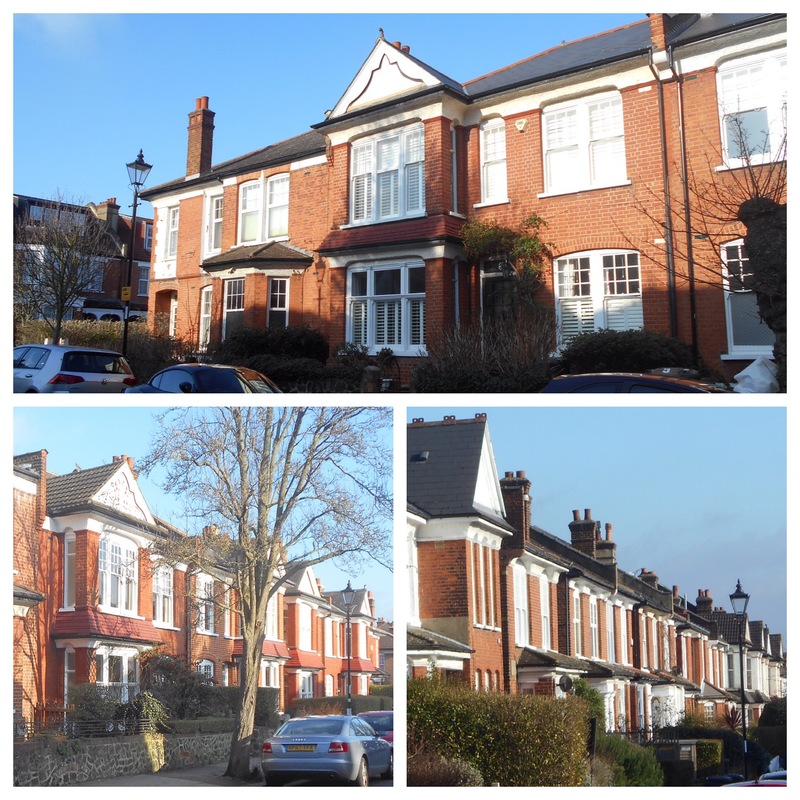 They were filled in when the Victorian terraces to the south of Wells Park Road were built before the century was out. Beyond the flats and concrete garages that replaced their late Victorian counterparts in the 1970s the route is barred by a locked a gate to Longton Nursery Allotments, with no sign of life beyond it on a cool January Friday afternoon. It has been a nursery or allotments since the late 19th century, perhaps too damp and at risk from flooding to allow development at that stage. It too had a small pond along the line of the stream’s flow in 1893, although this too had gone before the outbreak of the Great War. The next physical sign of the stream is another dip in the road, a relatively pronounced one in Jews Walk. 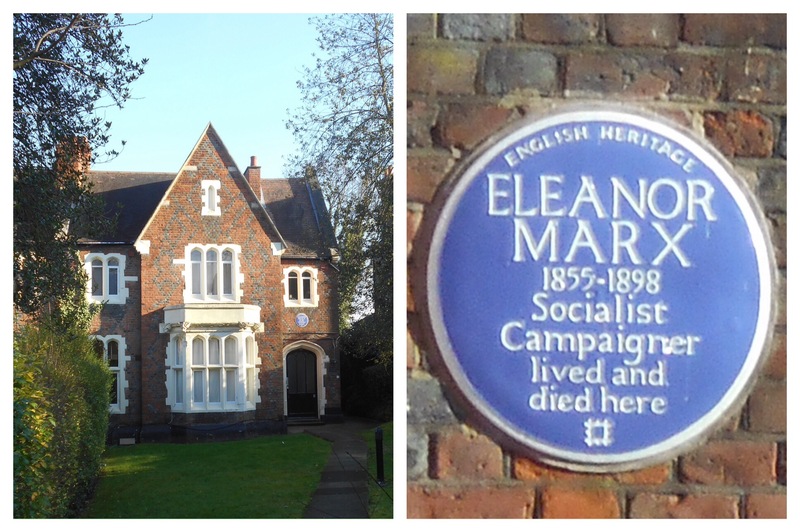 A few metres away was the home of Eleanor Marx at 7 Jews Walk (Source eBay Nov 2017); she was the youngest daughter of Karl Marx and she spent her last few years there with her long partner Edward Aveling – they had not married for political reasons. The historical orthodoxy, based on the inquest findings, is that she committed suicide after discovering that Aveling had secretly married an actress. A recent biography by the very persuasive Rachel Holmes, suggests that Aveling murdered her rather than it having been a case of suicide. 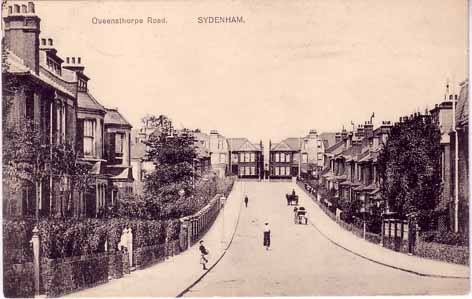 There is a little more on her time in Sydenham and the possible reasons for choosing the home in the Sydenham and Forest Hill History blog. The stream next ‘appears’ crossing Kirkdale close to Collingtree Road, it became visible during road works in the early 21st century. As Collingtree Road has an upward gradient towards the summit of Peak Hill the route will have skirted around its base into what is now a small park – Kirkdale Green, it may well have been joined by water from another source here as at least one spring has been found underneath a Collingtree Road house. The dip in the appropriately named Spring Hill shows the line towards the railway. There is a large mound of earth adjacent to the likely former route with some brickwork similar to ‘springs’ elsewhere – I have not found anything on-line as to whether the small summit has any significance. The short-lived Croydon Canal (opened in 1809) and then its successor the London and Croydon Railway will have blocked the passage it seems that that unlike some of the streams from Sydenham Hill, it appears that this one was culverted underneath – certainly it was still evident on the other side – after the railway largely took over the route of the Croydon Canal. Over the railway, the valley is obvious when crossing Silverdale before cutting through the Thorpes estate, where it was above ground pre-development as the 1863 map below shows. 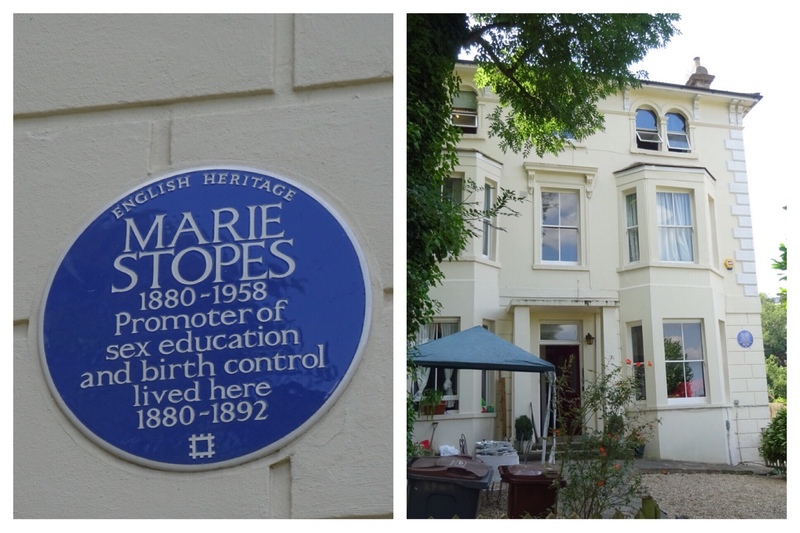 The ‘Thorpes’ Estate (a suffix to Kings, Queens, Bishops, Prince, Dukes and Earls) is a largely Edwardian development built by the firm of Edmondson & Sons between 1901 and 1914 over the garden of the Old House, the former home of the Mayow family – who gave their name to the neighbouring road and park. “Features and details used were inspired by the Queen Anne, neo-Georgian and vernacular revivals using red brick contrasted by white roughcast, multi-paned sash windows, grey slate roofs and decorative pargeting. 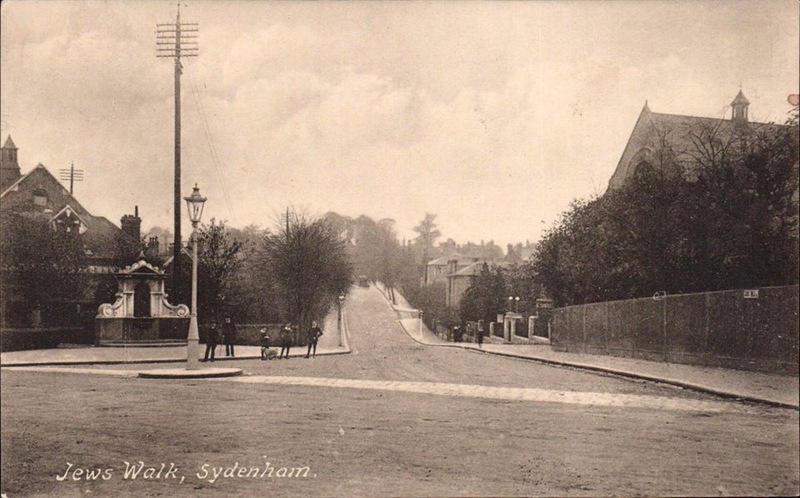 There are perceptible dips in the north-south roads on the estate as the postcard below (source eBay July 2016) shows. After leaving the Thorpes the lie of the land dictates that it would follow Sydenham Road – although it would have been hidden from view before the time of the first Ordnance Survey Maps; it may have fed a small ‘water feature’ in Home Park, and possibly supplied the long-lost Sydenham Brewery. 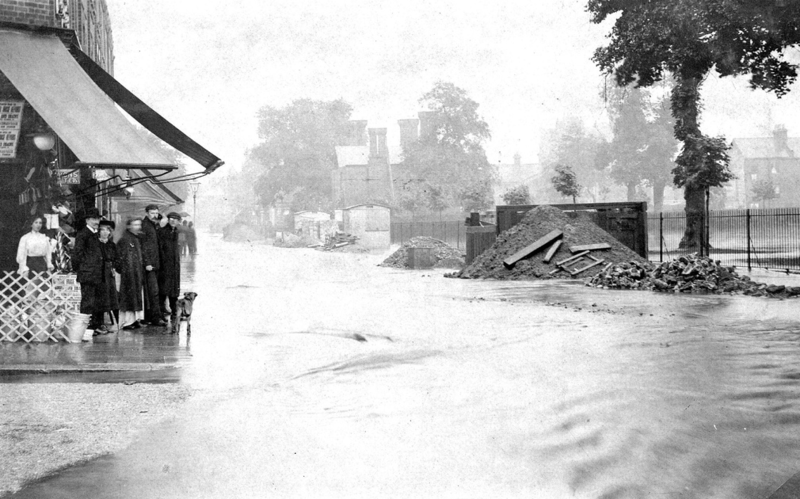 This is an area which has flooded in the past – possibly as a result of the stream bursting out from its culverting – the photo below looking toward Home Park is from 1907. The confluence with the Pool appears to have been between the unlikely pairing of gas works and watercress beds. It would have been under what is now Sainsbury’s car park. There is an outflow into the River Pool at roughly the right location – little in the way of water flow is ever seen from it though. The maps are all from the National Library of Scotland on a Creative Commons, the photo of the floods is via Steve Grindlay’s lovely photo stream on Flickr, which is well worth a visit, and is also on a Creative Commons. 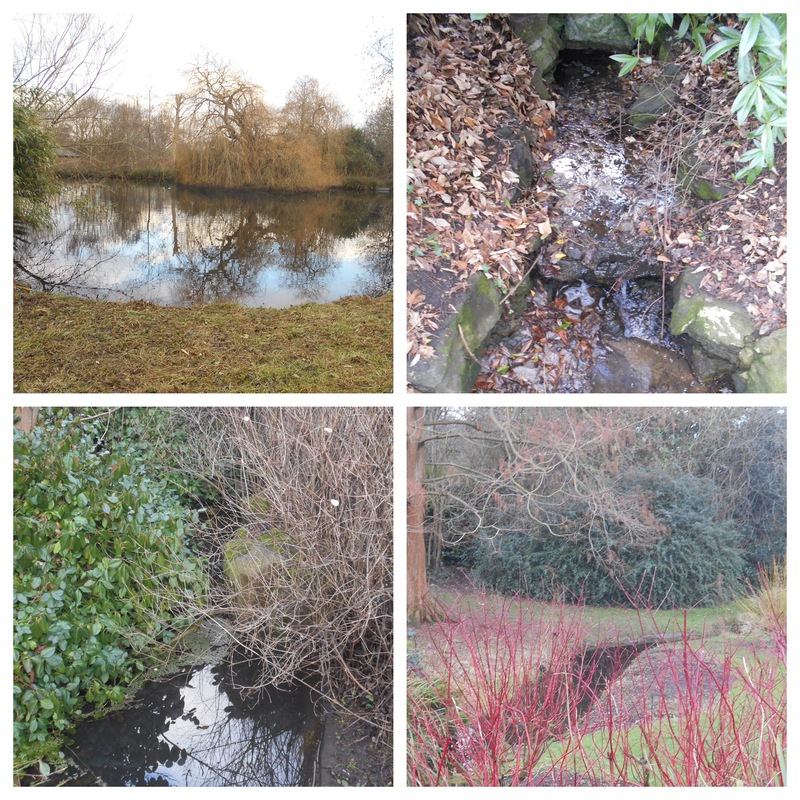 This entry was posted in Lewisham History, Rivers and tagged River Pool, Sydenham, Wells Park, Wells Park Stream on February 28, 2018 by Paul B.